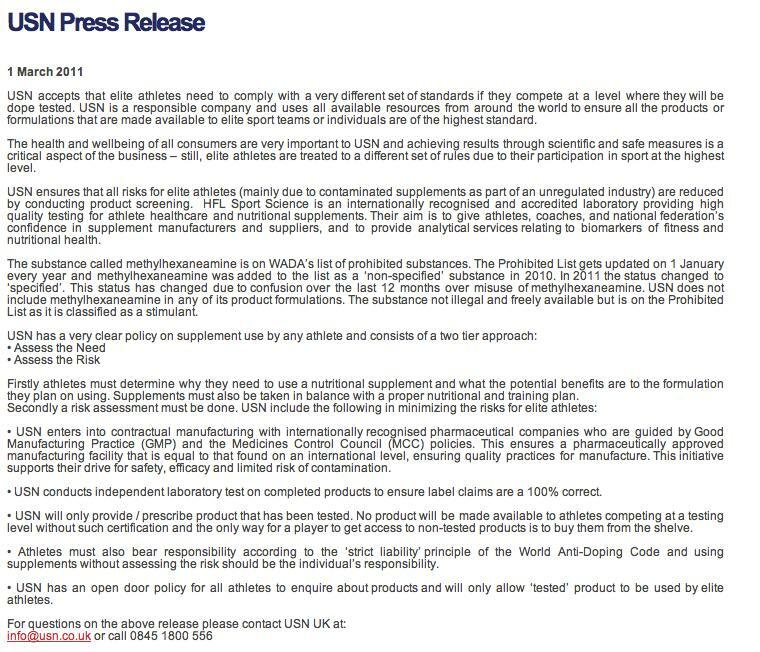 Below is a scan of a press release (relevant to a story on this website today) from a nutritional supplements company, Ultimate Sports Nutrition, headquartered in South Africa, that makes a range of nutritional supplements. USN’s UK website is linked here. The scanned press released was available, at this link, in the format it appears below at least until 10.30am on Monday 2 May 2011. Sportingintelligence publishes the scan of the press release today to illustrate USN’s public stance (we would argue a disingenuous stance), in relation to prohibited substances. (Disingenuous at least up to this point in time, the morning of 2 May 2011).